Lyle: Try playing riff 1 and riff 2 back to back with the jam track. Lyle: Notice for riff 2 I have a combination of hammer-ons and pull-offs, not over doing any one element. Lyle: Half way through the Lesson Sample you'll hear all 3 solo riffs played one at a time. Here's a jam tracks of all 3 solo riffs played together. coral: Very Allman Bros sounding. Lyle: Yes, they used the major pentatonic scale for that southern country sound. 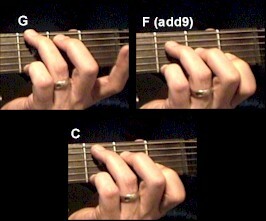 Lyle: There are several ways to finger the G chord, this is a good way to do it when playing a combination of G, F's, and C's because it keeps your fingers and wrist in the same basic position for easy changing. Lyle: If you're using an electric guitar, make sure you have the amp set to a clean setting. Lyle: This rhythm riff will sound good on an acoustic guitar too. Lyle: Now you can use this riff to play along to the looping jam track. See if you can play all the riffs from memory along to the jam track. Lyle: Lyrics: "My ____ died yesterday, My ____ ran away, My ___ stopped working, I guess I'll sing about it." Lyle: Well that's all for this lesson. See you next time!